This book serves two purposes. It introduces some of the major movers and shakers of Nehwon and, by presenting them as 'patrons' within the Dungeon Crawl Classic RPG, sets them up ready to play their part in your game whether or not your party's going to Lankhmar any time soon. There's seven of them all told, and they all appear in the tales of Fafhrd and the Gray Mouser by Frank Lieber - so if you don't know them, get reading for even more background about each one. For convenience, there's a list of stories in which each one features, so once you have picked one you know what to read. They are Death, Issek of the Jug, Mog the Spider God, Ningauble of the Seven Eyes, the Rat God, the Sea King, and Sheelba of the Eyeless Face. However, Ningauble has already been written up as a patron in Through Ningauble's Cave, and the material is not replicated here. So in effect there are six patrons in this book. Each one's entry begins with a brief outline of who they are, and what pledging to them entails. Then there is a table showing what might happen as a result of an Invoke Patron check. Not all outcomes are pleasant... or is it that some are more unpleasant than others? Patron Taints are also imaginative - if Death is your patron, for example, you may find yourself suddenly somewhere else with a compulsion to kill a given person... they are due to die, and Death has sent you to collect the soul as he's otherwise engaged! Then there's a third table for Spellburn. These again have been crafted with loving care. It's obvious that a lot of care and attention has gone into creating very appropriate entries on all three tables for each Patron. They suit the personality and style of the individual as presented in the story and have good game balance of benefit and curse, these are going to work well as Patrons for those party members who (are desperate enough to) approach them. 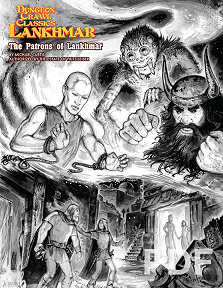 Return to The Patrons of Lankhmar page.